Neymar led Paris Saint-Germain past Liverpool, but the forward is not yet at full fitness. 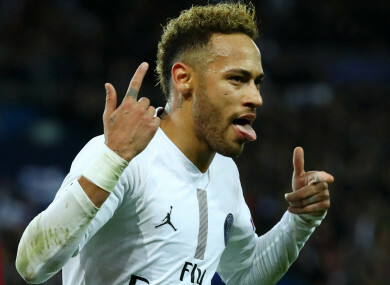 PARIS SAINT-GERMAIN star Neymar said he was not yet over his adductor injury despite leading his team past Liverpool in the Champions League. Neymar had been in doubt for Wednesday’s clash after suffering an injury while on international duty with Brazil earlier this month. But the forward starred, scoring as PSG claimed a 2-1 win to move into second in Group C.
However, the 26-year-old said he was not at full fitness yet, but felt his team needed him in such a big game. “I was not 100%,” Neymar told reporters, via L’Equipe. Neymar’s goal saw him become the all-time leading Brazilian goalscorer in Champions League history with 31. PSG (eight points) are second to Napoli (nine) in Group C after their win over Liverpool (six), and they are well placed to reach the knockout stage with a trip to Red Star Belgrade (four) to come on the final matchday. Email “Neymar: 'I wasn't 100%' against Liverpool”. Feedback on “Neymar: 'I wasn't 100%' against Liverpool”.